Dougie Almeida (Jimmy Kimmel & Finalist in World Series of Comedy) is originally from Queens, New York and spent most of his adult life as a corporate presenter for one of the largest financial planning firms in the country. His specialty was taking lifeless insurance presentations and transforming them into works of comic art. In his spare time, he fought as an ISKA Heavyweight Muay Thai Kick boxer, retiring at 10-0 and earning the title “Always Dangerous”. So, what do you get when you cross an inventive corporate executive with a retired kick boxer? A stand-up comedian, of course! 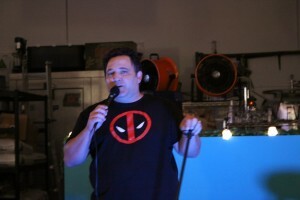 Prior to taking the stage, Dougie gauges his audience, reaches into his vault and prepares his onslaught of humor. Once on stage, he delivers blow after blow of hilarity, hitting the audience with punch line after punch line. His wit and stage presence is second to none. One thing is always certain – Dougie Almeida will KNOCK YOU OUT! Dougie Almeida is Always Funny, Always Professional, and yes, Always Dangerous. 1. What got you into stand up comedy? I always loved it; I was always that witty guy that would say something funny. I remember back in middle school. I walked in with my friend and we had a substitute teacher. You always gotta bust balls with a substitute teacher. We walked in a little late, the teacher said that you guys are a little tardy. I said no I am Dougie and he is Eddie. Everyone in the class cracked up; I was like wow this is good. I was a spokesman for a big insurance company doing presentations in front of hundreds of people. I wouldn’t stick to the script and make people laugh about annuities and life insurance. I figured that was my life calling. 2. You are actually one of the rare comedians in the scene that’s successfully married; what’s your secret to pulling this off? If you’re gonna do this. If you don’t have a great woman than you need to wait for them to fall of or you need to concentrate on your career. My wife is patient. We’ve been together for 12 years before getting married. The most important thing is that she wants to see me be happy. She’s a great support on that. 3. What advice would you give comics? Quit, do karaoke. There are enough of us on the scene. Don’t fool yourself anymore. Always be honest with yourself. To know oneself is to know god. If you know what you can do, what you can’t do than own up to it. Don’t be afraid to listen to advice. First thing to do is to be honest with yourself. Second thing is you are doing this because you love to get the happiness from getting the laugh and don’t do it just for the fame or money. You gotta be professional, funny, consistent, dedicated and have thick skin. You gotta be all that and if you aren’t than get a job at Walmart. 4. How did you work your way up to being a headliner? Continuity; it’s the regular practice of disciplined events. You gotta get on stage 4 to 5 times a week. Keep writing jokes and find a way to be consistent. This concept sounds so simple but people give up. You just need to stick with it. I got this from martial arts. Be professional, funny and cool. 5. What types of food do you enjoy cooking? I got a wife; you gotta find a woman Fasil. I can cook and am a great cook but I don’t need to cook as my wife is a great cook. There are things she does better than I do. That’s what she gets to do. 6. Who are you favorite comics to watch locally/nationally? I don’t have a favorite comic to watch. However, I do appreciate local comics who work real hard and continue working on their craft. As for national comics, I try not to watch too many comics. Don’t want to pick up subliminal idea. However, in the past I loved Rodney Dangerfield, Richard and George Carlin. 7. Why should people check you out at the Spill The Beans Comedy Show? It’s a fun venue with low ceilings, packed house and I am gonna come up and know you all out. I am going to do new jokes. It’s going to be intimate and I am going to talk about real stuff. I am going to unload it all this Saturday night.